Computer Lab- We have a fully equipped computer Lab with 37 computers. Each child has a computer to herself or himself. Smart Classes- Almost all the classrooms are fitted with Interactive boards and the children enjoy their lessons immensely with it. 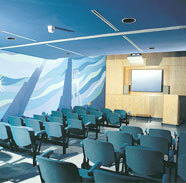 AV room- The school boasts of an AV Room where children are shown videos and movies. Library- The Library is the place where the children immerse themselves in the joys of reading. Children are encouraged to issue books and read them. Copyright © Navy Children School, Karwar.